The Avastar Rig tries to keep most of its complexity under the covers. The most important and unfortunately also the least understood part of the rig is its control bone section together with its set of Bone constraints. Here is a bit of information to shed some light on this. Due to the Bone constraints the Deform bones can normally not be directly moved or rotated. So you have to move (animate) the Animation bones and weight the Deform bones. When you Skin your Mesh (When you do weight painting tasks) then you almost always want to unlock the Bone Rotations of the Blue Deform Bones. 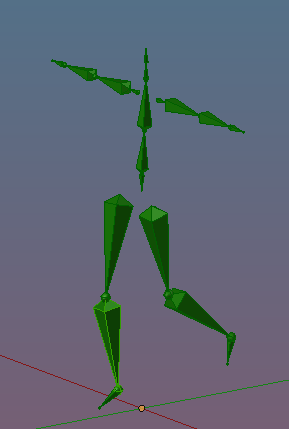 Then you are free to pose the Deform bones for testing purposes. When you Animate your Character, then you may want to unlock the Location Constraints of the Green Animation bones, so that you can also perform Location animations. Note: The Bone Workflow Presets affect the Bone Constraints in a subtlew way. 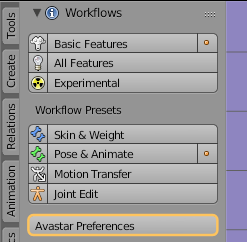 When you select the Skin & Weight preset for example, then the constraints are automatically set appropriate for the Weighting workflow.